This Mexican dessert is traditionally served at Christmas time. 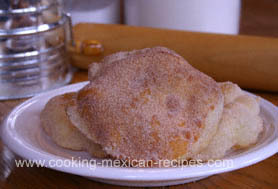 In Mexico these crisp pastries, called bunuelos or sweet fritters, are often eaten as a mid-afternoon sweet. I could eat these any time. They remind me somewhat of snickerdoodles with their sugar and cinnamon topping. They are very hard to resist. Why not make this heavenly mexican dessert and finish off your next Mexican food fiesta in style. Try them for breakfast with a cup of coffee or Mexican hot chocolate or anytime at all for a snack. In a sauce pan, (I used a 2 qt. saucepan with a 7 1/2 inch diameter) add canola oil to at least 2 inches deep and heat the canola oil on medium. Keep an eye on the oil so it doesn’t get too hot and start smoking. Add the butter and mix it in with your fingertips. Work the butter in until it has the consistency of corn meal. In a separate bowl, add the eggs and beat gently with a fork. Add the milk to the eggs and blend. Pour the milk/egg mixture into the flour mixture and stir with a spoon until the dough forms a solid mass. Dust a wooden cutting board with flour and knead the dough lightly for 2 or 3 minutes or until the dough is smooth. Pinch off small pieces of dough about 3/4 to 1 inch in diameter and shape into balls. Let the balls rest for 15 minutes. Dust a wooden cutting board with flour and roll out each ball into a thin pancake about 1/8 inch thick. Your circle should be about 4 inches in diameter. Place your circles of dough on a sheet of wax paper until you are ready to cook them. Mix the sugar and cinnamon, for the topping, in a gallon-size ziplock bag. Fry the circles of dough in hot oil. They should bubble up right away and turn a golden brown in about 30 seconds. Turn it over and cook and additional 30 seconds. Play with the temperature of the oil by noticing how long it takes for the dough to turn golden brown. If it takes longer than 30 seconds, turn up the heat a bit. If you notice the dough turning dark brown in ten seconds, turn the heat down. Once your Mexican dessert is a nice golden brown on both sides, Remove them with tongs and place them on paper towels to drain. Once they are cool enough to handle, place one bunuelos in the ziplock bag with the sugar and cinnamon mixture. Gently tip the bag to coat the bunuelos with the sugar mixture. and then set on paper towels to cool. Enjoy these hot off the stove! Now you can make your very own Mexican dessert right at home and watch these disappear… quickly.